Jérémie chose to expand his rice farm. Growing rice is an activity that the Bakwé know all about. Traditionally they grow rice once a year for their own family’s consumption. The rice from this farm, however, will be sold. 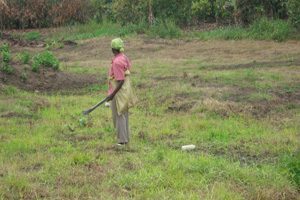 With farms now being planted and replanted on the same plot of land, weeds have become a real problem for rice farmers. After the land is cleared in early February it has to be prayed for weeds almost as soon as the rice germinates. 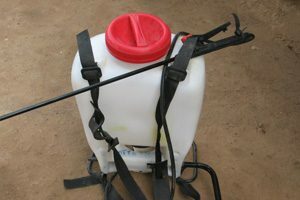 Jérémie bought this backpack sprayer for use on his farm which allows him to apply his herbicide. Before, he would either have to rent some else’s sprayer or pay to have the weeding done manually. 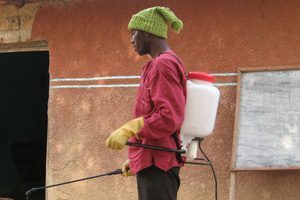 Now, when he is not using his sprayer he will be able to rent it out for a fee if he decides to. Preparing to go to the field. The cleared field with weeds growing faster than the rice! 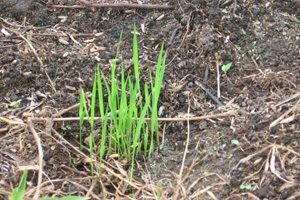 Rice poking up through the soil. JÉRÉMIE’S STATUS: Jérémie’s one hectar rice farm did not produce as he had hoped either, for the same four reasons as Augustin’s experience: 1) the soil was depleted and the local agricultural agent did not fertilize his farm; 2) the seed he chose was not of good quality; 3) the rain did not come at the appropriate time; and 4) the birds damaged much of what came up. 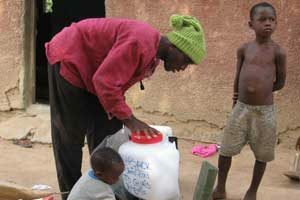 He also, out of the expected 60 bags of rice, only harvested 10 bags. 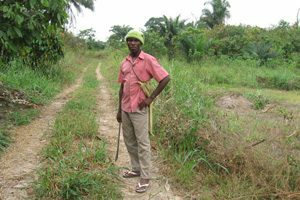 Jérémie continues to slowly pay back his loan from his regular farming and pig raising activities. In August this year (2009) we will hold an evaluation seminar with the Bakwé microentrepreneurs, led by Dr. Kjell Christophersen.